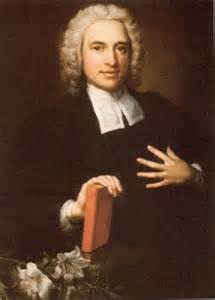 Today we say “Happy Birthday” to Charles Wesley, born in Epworth, England, 1707. Often eclipsed historically by his better known brother – Methodist co-founder and fiery preacher, John – Charles has nonetheless left a significant mark on the Protestant persuasion, composing literally thousands of church hymns during his lifetime of 81 years. Preaching in the open air to tens of thousands, John did most of the preaching, while Charles led the faithful in hymns at revival meetings. They were not always welcomed, however, sometimes met by raucous mobs who threw stones, dirt and eggs in their faces. Traveling by horseback from one town to the next, if Charles thought of a hymn, he would detour to the house of the nearest acquaintance, demand a pen and ink and write it down. Personally I have heard only a few of those inspiring melodies, but during the Christmas season I have frequent opportunities to hear my favorite, “Hark! The Herald Angels Sing.” Usually sung robustly by a festive choir surrounded by sparkling candle lights and streams of ornamental holly, it’s an almost must-do song for traditional Christmas Eve services. A thundering pipe organ accompaniment always adds an element of soul-stirring intensity to the performance. My favorite lyric in the entire piece is simply “God and sinners reconciled,” a short but dynamic phrase that to me expresses the whole idea of why we actually celebrate a day called Christmas. It’s John 3:16 and all the rest of the Bible presented in a way that anyone, anywhere, of any age can understand. No doctorate in theology needed. Adam broke the relationship with God through disobedience. Jesus, the last Adam and the Second Man, made it possible to get back to the original plan: eternal life with the Creator, on a personal relationship level. Bravo, Charles Wesley! The herald angels are still singing.